Thoughts from a Buttonmonger: Kissing Under the Mistletoe. Kissing under the mistletoe is first found associated with the Greek festival of Saturnalia and later with primitive marriage rites. They probably originated from two beliefs. One belief was that it has power to bestow fertility. It was also believed that the dung from which the mistletoe would also possess "life-giving" power. In Scandinavia, mistletoe was considered a plant of peace, under which enemies could declare a truce or warring spouses kiss and make-up. 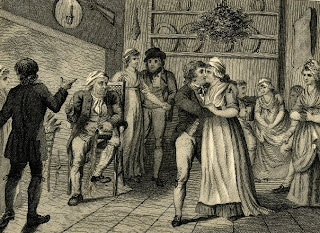 Later, the eighteenth-century English are credited with a certain magical appeal called a kissing ball. At Christmas time a young lady standing under a ball of mistletoe, brightly trimmed with evergreens, ribbons, and ornaments, cannot refuse to be kissed. Such a kiss could mean deep romance or lasting friendship and goodwill. 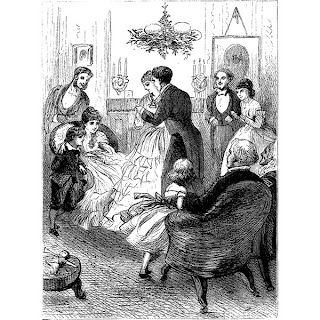 If the girl remained unkissed, she cannot expect to marry the following year. In some parts of England the Christmas mistletoe is burned on the twelfth night lest all the boys and girls who have kissed under it never marry. Whether we believe it or not, it always makes for fun and frolic at Christmas celebrations. Even if the pagan significance has been long forgotten, the custom of exchanging a kiss under the mistletoe can still be found in many European countries as well as in Canada. Thus if a couple in love exchanges a kiss under the mistletoe, it is interpreted as a promise to marry, as well as a prediction of happiness and long life. In France, the custom linked to mistletoe was reserved for New Year's Day: "Au gui l'An neuf" (Mistletoe for the New Year). Today, kisses can be exchanged under the mistletoe any time during the holiday season.